Perhaps you have used compost tea on your plants and saw the amazing effect it had. However, if you think your plants loved their compost tea, try giving them a drink of worm-casting tea. No, it’s not the liquid dripping from the bottom of an elevated worm bin – so what is it? This “tea” is a liquid concoction made by steeping worm castings (worm poop) in water. This is an extracting process that draws the nutrients from the castings into the water so they can be more easily and quickly absorbed by thirsty plants. 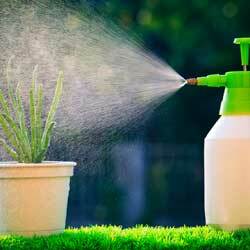 Use it on your plants by drenching the soil around the roots or spray onto the leaves for foliar absorption. Both spraying and drenching eliminate the labor of spreading solid compost. And, applied as a liquid, plant resistance to pests and diseases and microbial activity in the soil are all increased. While compost tea contains many beneficial microbes, it’s nothing compared to worm-casting tea that contains a much larger and diverse microbial population due to the various physiological life processes of the worm. To really kick up the benefits of worm-casting tea, try aerobically brewing a batch. This simple process increases the microbial populations by circulating the microbes in a nutritious and aerated solution to double the population every 20 minutes. This method also eliminates any possibility of E. coli, which can be present in both compost and worm-casting tea brewed by extraction. Connect 3’ of tubing to an air stone. Attach other end to small air pump. Put 4 gallons of water into a clean 5-gallon bucket. Let sit for 24 hours to allow chlorine to dissipate. Alternatively, use non-chlorinated water. Plug in pump and place air stone at bottom of bucket to begin agitation. Add 4-8 cups earthworm castings, crushed into small bits, if possible. Brew until a froth or slime appears on the water surface. The smell should now be gone or very weak. This indicates the maximum population has been reached and no food remains for the microbes to eat. This solution may contain over one billion microbes per teaspoon of solution! The overall brewing time is temperature dependent, however, and warmer solutions will brew more quickly. At all times, leave the bubbler on to continue oxygenating the microbes. Strain the solution to remove any solid particles. Apply to plants as soon as possible to take maximum advantage of your tea’s nutritious properties. Note: The odor should be minimal or vaguely pleasant. If the smell is strongly unpleasant or similar to sulfur, do not use. Pour it over some weeds for a natural herbicide instead. You can use your worm casting tea anywhere in your garden: upper and lower sides of leaves, on flowers, vegetables, trees, shrubs or soil. Spray in the early morning or evening or in the shade during the rest of the day. Use the remaining castings as you would any compost, after all, they still contain a diverse microbial population! Now, raise your teacup and toast to a healthy, luxurious garden and landscape, all thanks to nutritious worm-casting tea!